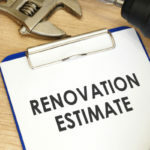 Conducting small renovation projects every once and again helps keep your home from becoming outdated. A great way to breathe new life into your kitchen is to give it a fresh coat of paint. There are so many aspects of your kitchen that can benefit from new paint, granting you endless options to spruce things up. Here we provide answers and inspiration in order to remodel your kitchen simply using paint and a brush. What Can You Paint In Your Kitchen? Paint the cabinets. Cabinets can be refaced, cleaned up, and given a new paint job in order to alter and/or refresh the overall look of your kitchen. Paint the walls, and remember they don’t all have to wear the same colors! Paint bar stools and chairs to look like new and add a splash of color to the room. Paint the insides of your cabinets. For instance, you could paint the interior of white glass-door cabinets a shade of eggshell blue for a pretty pop of unexpected color. Paint the ceiling! Everyone thinks to paint the walls, but the ceiling is a great canvas that often goes forgotten, left a blank shade of white. Painting the ceiling an appropriate color to go with your kitchen will make your cooking space stand out in a whole new way. Paint vinyl flooring in your kitchen. If you don’t like the vinyl flooring currently installed, and it doesn’t have any signs of chips or cracks, you can paint it. You don’t have to be a professional artist to pull off the task. Use a liquid deglosser and a latex stain-blocking primer for glossy surfaces. You will want to use a modified epoxy latex paint to conduct your work. This type of paint is created with a harder binder than the paint used on your walls, and is thus able to withstand people walking over it. Lastly, add clear polyurethane over the floors for a coat of protection. Paint laminate countertops. If you can’t afford new countertops you can paint laminate counters. You will use a specialty primer intended for nonporous surfaces along with two coats of acrylic latex enamel. There are a number of options for paints and primers made for laminate surfaces. This is typically viewed as a more temporary measure because countertops receive so much use the paint may begin to wear away with time. Finding the best paint color for your kitchen has never been easier! Most people keep their kitchen walls a boring shade of white, because it’s easy and lacks risk. 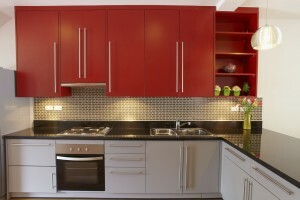 Yet, the best looking kitchens take chances and incorporate a dose of color in just the right places. Different colors provoke different reactions, and your favorite color isn’t always the best option for your kitchen walls. So how do you know which color paint is the best for your kitchen? The most important thing is that all of the paint in your kitchen matches and goes well together. Take into consideration the color of your appliances, accent colors, the style in the rest of your home, and even the color of your window coverings. 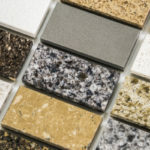 Every last color used throughout your kitchen makes its own unique statement, so nothing should go forgotten. Blue is a great color for kitchens, and there is a shade of blue suited to almost every style. Lighter shades of blue pair well with other light, bright shades, such as light yellow for a very sun combination. Be careful that you don’t use too much blue, as the color can become overpowering when overused. If you use a dark shade of blue for larger components of your kitchen, make sure to complement this with plenty of white, grey, or other light colored accents. Gray is another great color to use in the kitchen, and is showing up more and more in high-end kitchens. Finding the right shade of gray is key to using this neutral tone to its full potential. Gray is great because it is complementary to almost every color you could ever want to use in your kitchen, keeping your options wide open. 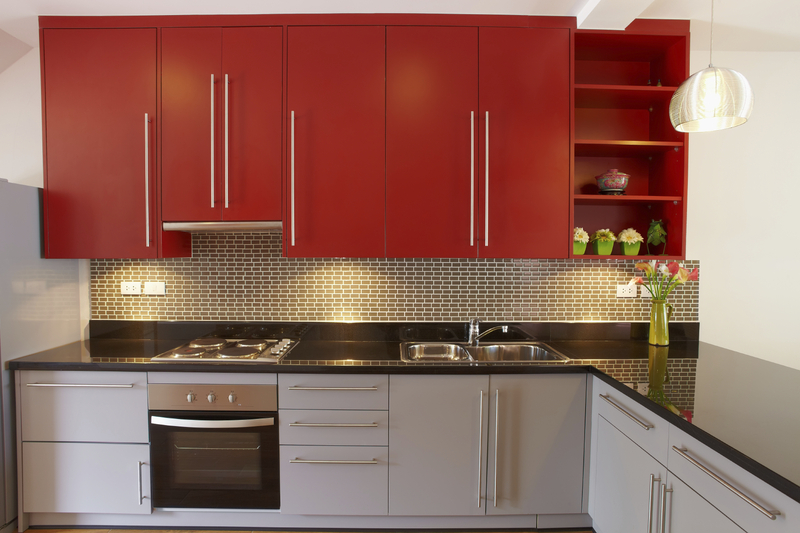 Kitchens look great when they incorporate red, after all the color red is said to awake the appetite. There are numerous shades of red you can use, from deeper shades to more orangey tones. Painting your kitchen white is a very popular option. White can be used as an accent color, or as the predominant tone in the room. White makes a room appear brighter, and larger. If you pick white for the larger components of your kitchen, you can get more playful with colors because white goes with everything. Black is becoming a more and more popular option for kitchens, used on back splashes, cabinets, and countertops. If you decide to use black as a main color in a kitchen it’s important that you have other pops of color, and accents so that the kitchen doesn’t drown in darkness. 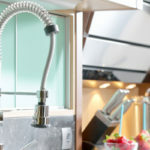 In reality, you can paint your kitchen any color you want, go extreme and redo your kitchen in a bright shade of green. Even with unique and bright colors you can still create an incredibly classy kitchen that others appreciate just as much as you. All that it takes is making sure the colors you select go well together and create a cohesive look. For instance, light green kitchen walls would pair well with stainless steel appliances, high ceilings and a lot of white accents. 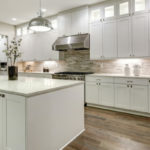 If you are looking to remodel your kitchen, contact Tops Kitchen Cabinet today for unbeatable prices and reliable service.